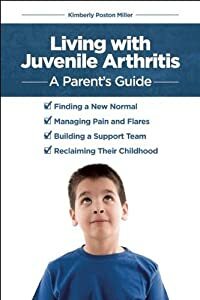 Living with Juvenile Arthritis: A Parent's Guide provides support to parents and caregivers of children with juvenile arthritis through helpful tips and guidance from a parent who has successfully navigated the challenges of raising two children with juvenile idiopathic arthritis. Allow author Kimberly Poston Miller to help you and your family find your path. Learn more about arthritis, its symptoms, diagnosis scenarios, treatment options, managing pain, and handling flare-ups. Discover strategies for dealing with the unpredictability and individuality of your child’s condition. Build a support team of health-care professionals, cultivate healthy relationships within your family, and focus on what’s most important—raising a happy, well-adjusted child. Kimberly Poston Miller is the mother of two children who live with juvenile idiopathic arthritis. Through the management of her sons’ chronic illnesses, she has become not only an active and inspired advocate for arthritis awareness, but also a seasoned expert on finding and maintaining balance within a family that is beset by extreme circumstances and often overwhelming challenges. In her first book, Living with Juvenile Arthritis: A Parent’s Guide, Kimberly offers hard-earned wisdom seasoned with hope and encouragement to parents and caregivers of children with arthritis everywhere. Though I never had this as a child, nor knew anyone who did have this, the book itself was fascinating and would be an amazing resource for anyone dealing with this terrible condition. As a parent with a child dealing with other medical issues, I understand the need for resources such as this that are user friendly, easy to understand and patient centered. This book is all of this and more. I loved that the book comes from families that have been there and have dealt with the issues at hand. On top of this, the book was complete and gave the reader a ton of information on everything from condition management to lifestyle and much more, you get a bit of everything in this book! All-in-all if you are living with this condition or know someone who does, pick this up - you will not be disappointed!